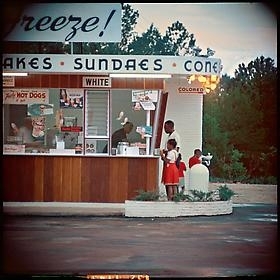 "Iconic Gordon Parks photos show shades of gray in American race relations"
At first glance, it seems a memory of an innocent time: A father stands at the window of an ice cream stand, buying treats for his young children. But the family is African American, and the sign above them says “colored.” Gordon Parks made this color photograph in 1956 in Alabama, when separate-and-unequal strictures shadowed nearly every aspect of American life. Parks is best known for his black-and-white work, much of it for Life magazine and well represented in Adamson Gallery’s “Gordon Parks: An American Lens.” The show includes high-contrast shots of Harlem in the late 1940s, as well as dramatic 1960s candids of Muhammad Ali, Malcolm X and Duke Ellington. Also present is the photographer’s take on “American Gothic” — a starkly posed 1942 portrait of office custodian Ella Watson, made when Parks worked at the Farm Security Administration in Washington. That photo is a rare overlap between this selection and the Corcoran Gallery of Art’s Parks exhibition in 2011. Parks, who died in 2006, made his reputation as a photojournalist before expanding into film, literature and musical composition. In the fall, the centennial of his birth was marked with the five-volume “Gordon Parks: Collected Works.” It unveiled many previously unpublished pictures from the “Segregation Series,” the source of that picture of the ice cream stand. Twenty of the photos were published in Life, but more than 70 had gone unseen. The series includes other sorts of American gothics: a formal portrait of a dignified older couple, Mr. and Mrs. Albert Thornton, and “Outside Looking In,” in which black girls gaze at whites on a forbidden playground. The oppressive word “colored” appears frequently. Contrasting the Alabama pictures are some that Parks made seven years later, in his native Kansas. They show only nature and children, without rules or signs of any sort. “Boy with a June Bug” is rustic and relaxed, even utopian. Parks certainly didn’t believe that African Americans could escape permanently into summer vacation; his other work is full of images of them in conflict with society. But these photos, in their way, show as much yearning for freedom as Parks’s fiercer images.